(pink line plot) – GC percent. Black line = 50% GC, light grey area = 50% – 30 % GC, dark grey area = > 30% GC. (green stacks) – Repeat Masker matches. 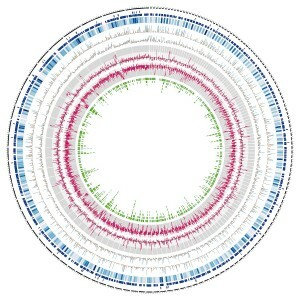 The genome assembly contains numerous low GC, high coverage, repeat rich regions, with low overall gene density. This suggests an assembly with collapsed repeats of a genome that is overall rich in repeats.